The first and only interventional cardiology reference with a global perspective. This comprehensive, clinically oriented resource offers readers around the world superb practical guidance based on the best evidence available today and integrates the latest advances in devices, techniques, imaging, and collaboration with surgical subspecialties. 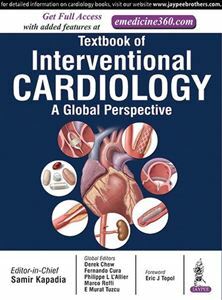 Its authors are world-renowned leaders in their fields, who offer invaluable insights into how interventional cardiology is practiced in a wide range of countries. The print version is complemented by an online version featuring more than 345 lucid videos that demonstrate how a broad spectrum of imaging studies and procedures are done. Videos demonstrate diagnostic studies and interventions in the complementary online version of the textbook. Broad issues in the practice of interventional cardiology are considered, with chapters on working with the multidisciplinary heart team, the appropriateness of intervention, reporting and monitoring of outcomes, the critical appraisal of clinical trials, and more. Puts practical, real-life examples at readers’ fingertips with extensive chapters dedicated solely to clinical cases at the end of each section. Illustrates important concepts, techniques, and information with more than 1000 clinical photographs, imaging studies, illustrations, tables, and more. Digests key points with a synopsis written by the section editor at the beginning of each chapter. Identifies important gaps in our understanding of interventional cardiology for future investigations. Chapters 10, 28, 32, 38, 39, 58, 64, 71 and 78 contain video(s).